The banner drop marks the beginning of the “Post-Peabody St. Louis” week of action, during which activists and community members will target institutions around the city that enable Peabody Coal to continue their business of causing global warming, contributing to St. Louis’ high asthma rates, stealing tax dollars from St. Louis public schools, and withholding miners’ pensions. 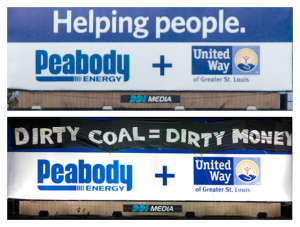 “Peabody’s connection to the United Way may be the most egregious of its attempts to stamp its brand name on our city. Peabody, through the United Way, funds groups that work hard to treat asthma and cancer and provide air conditioning when we’re in heat waves. That is a deliberate tactic to cover up the health impacts and global warming that Peabody causes,” said Dan Cohn, member of MORE and Washington University student. In May, community members met with Gary Dollar, head of the United Way, to express their concern with the decision to choose Boyce as the head of the campaign and demand that a new head be chosen to replace Boyce. Although Dollar said he would relay the group’s message to the United Way Board of Trustees, he also said it was highly unlikely that Boyce would be replaced. Indeed, Boyce remained the campaign chair.